Sessions will be added to the schedule on a rolling basis, I’ll announce sessions on Facebook first so make sure you ‘like’ the Facebook page! I’ll also update those on the mailing list, so please subscribe if you haven’t already. If a booking link is not available we are not taking bookings for that session yet. You can book with or without board hire. If you try to book and it is not showing as space available please do contact me to check. A reminder that if we do have to cancel your booked session due to the weather you can get a refund or transfer to a future session of your choice. As we may have to cancel late notice you MUST include an email address and mobile phone number when you book and check your messages and email on the day (if weather is looking uncertain or changeable this could be a couple of hours before). To guarantee space you do need to pre-book as we need to ensure enough boards and tethers (or to add an extra session or instructor) & know who is coming in advance in case of any changes due to weather. You can book with or without board hire – if you have your own it needs to be a minimum of 10ft long, 30cm wide with a soft deck, and the bigger the better! Please chat to us if unsure. 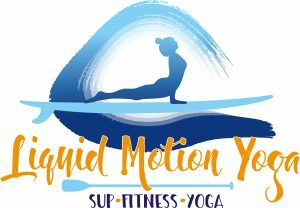 We can also help you to get an amazing deal on your own SUP, chat to me or call Bob at 4Boards on 02380 894583 and tell him you want the Liquid Motion Yoga deal! You can wear a wetsuit, boardshorts and rash vest, swimwear or regular yoga wear – it’s not a given you will fall in but bear in mind you might & the boards are wet and therefore you will get a bit wet due to contact with them. Wetsuits can be hired from Nick at Shoresports for just £2 for Liquid Motion Yoga attendees. Sessions are weather permitting – should we need to cancel a booked session (due to high winds, lightning or if temperature is below 10 degrees c) we can offer alternative dates or you can attend my regular on land classes too, but please note there are no refunds once a place is booked and while we can accommodate transfers once booked to a different session we need 48 h notice (if you can find someone to fill your place we can waive that of course). If you have no paddleboard experience you should book a learn to SUP class first, speak to Nick at Shoresports or contact us to help you get started! We’ll be running these alongside the classes over the summer and ongoing. For Paddle Fit classes you need to be a proficient paddler, so please book a session with Nick if you have limited SUP experience, for the SUP yoga it’s less of a problem as we don’t have to paddle! YOU MUST LEAVE AN EMAIL WHEN BOOKING AND PLEASE MAKE SURE YOU CHECK YOUR EMAIL ON THE DAY IN CASE OF CANCELLATION – we are weather dependent and I may need to cancel late notice if conditions aren’t suitable – this might be when I get to the Quay in the morning if the forecast is inconclusive. I will NOT call or text or update Facebook – it will all be done direct to those booked on the session through email (you can text me if unsure of course and I will reply). Places are non-refundable unless it is because I have had to cancel a session (in which case I will refund or transfer your booking), however I can credit your session to a future session with at least 48h notice, and transfer to a friend at any time.